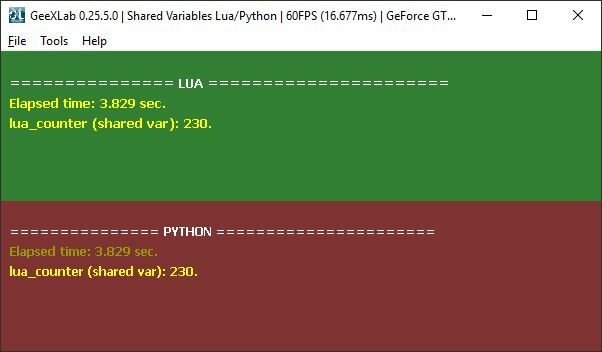 Is GeeXLab intended to work with either LUA or Python? access a value both in python and lua? I know this kind of an odd question, I just happened to run into this scenario: I started something in python, but found an interesting utility lib written in lua. GeeXLab is designed to work with Lua, or Python or both scripting languages at the same time. It's not a bug, it's a feature. Lua and Python are just tools to create you demo/app with GeeXLab. You can use both languages in the same demo. For example, you can have two INIT scripts (one in Lua and one in Python) and one FRAME script in Lua. You are free. Scripting languages live in their own virtual machine/world. They are isolated from each other and can not work directly together. I found a simple workaround: shared variables. Shared variables (SV) allow you to create special variables that can be read/write by Lua and Python. You create a SV in Lua and a Python script can read it and write it. SVs are managed by the gh_utils.shared_variable_xxxxxxx() set of functions. In the demo a SV (lua_counter) is created and incremented every frame in Lua. This variable is read in Python and displayed. There is no way to call a Python function in Lua (or vice-versa). This is amazing, shared variables are totally fine for sharing simple data etc.